- The US Dollar has traded up to fresh seven-week highs this morning, extending gains that started to show last week. As we move into a week that brings rate decisions out of both the European Central Bank and the Bank of Japan, the Greenback is threatening a deeper bullish move as the backdrop may be a bit more open for dovish tilts at both the ECB and BoJ. 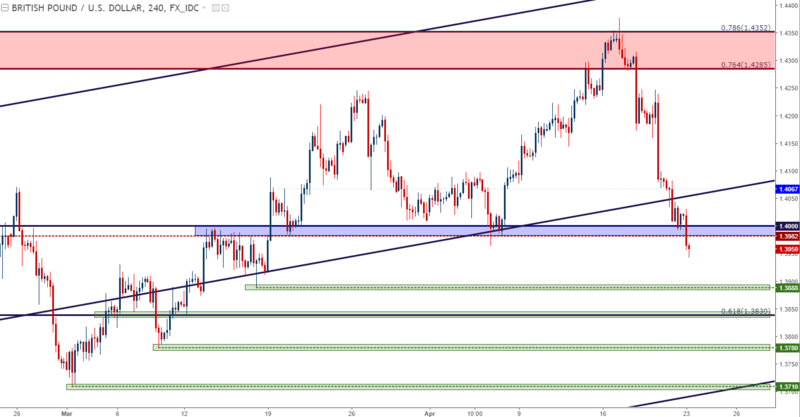 - USD/JPY has broken-out to fresh two-month highs, and EUR/USD is testing a key area of confluent support as we open into this week. 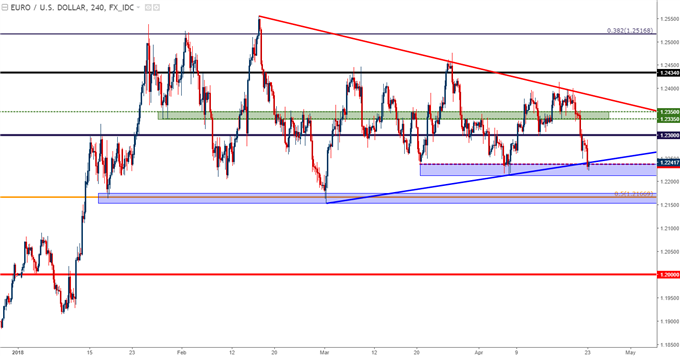 We look at both setups below, while also taking a look at NZD/USD and GBP/USD after each put in interesting moves last week. The US Dollar is higher on the morning, extending gains from last week after strength began to show on Tuesday morning and continued through the Friday close. As we open a fresh week, DXY is trading above a trend-line that’s held the highs for over a year, begging the question of whether we’ll see a larger move of Dollar-strength as we move into a week with rate decisions out of both Europe and Japan. 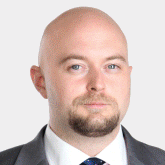 In our webinar last Thursday, we started to look at a backdrop growing more accommodative for a short-term move of US Dollar strength. After the aggressive reversal in GBP/USD last week, the US Dollar was exposed as one of the few currencies backed by an economy that a) is seeing inflation continuing to gain and b) has a Central Bank looking to get even more hawkish. In March, the question of whether we’d see three of four rate hikes out of the Federal Reserve in 2018 came up multiple times. In the early-portion of the month, new Fed Chair Jerome Powell alluded to this at his first day of Humphrey Hawkins testimony. This was partially obscured just a couple of days later by the initial tweet referring to tariffs towards China; and the focus then moved on to ‘trade wars’ and away from near-term monetary policy. But a bit later in the month that question came up again around the Fed’s rate decision, with the takeaway coming from the Fed’s dot plot matrix that showed a median expectation for an additional two hikes in the year, making for a total of three rate hikes in 2018. Since then, we saw a rather aggressive inflation print for the month of March when CPI printed at a one year high, and this may be driving the Fed closer to a fourth hike in 2018. That inflation print helped the US Dollar to find a bit of support, but the big move of strength showed about a week later, starting last Tuesday and Wednesday. This is when that disappointing UK inflation print came out, and this dimmed the chances of additional rate hikes out of the Bank of England this year after their next decision in May. 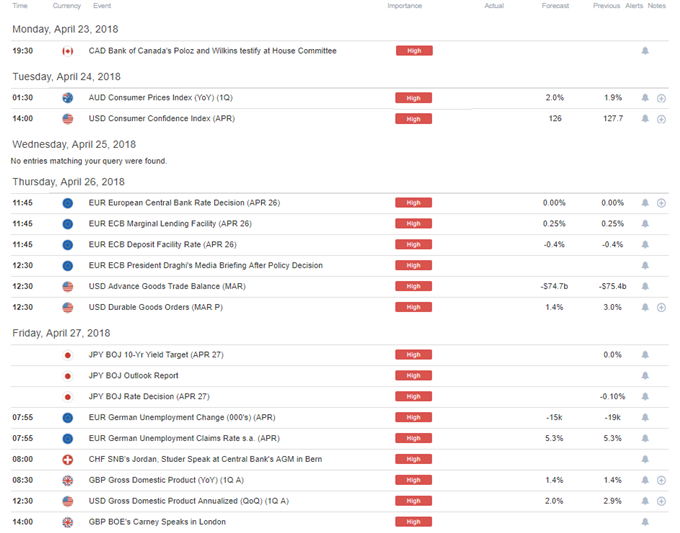 Later this week, we get rate decisions out of the European Central Bank and the Bank of Japan; and in each economy we have falling inflation and softening fundamentals, both of which make for a less-concerted case for normalizing policy or hiking rates or even thinking about the end of QE. This could further expose the Dollar to strength, as each of the Euro and the Yen have seen varying degrees of buying on the basis of monetary policy expectations. With a weaker case for tighter policy in each of Japan and Europe, the backdrop may be opening for a return of USD-strength as we move deeper into Q2. As we open the week, the US Dollar is making a fast-approach at the March high of 90.94, which runs directly underneath the 2017 low at 91.01. The US Dollar is up by 1.7% from last week’s low, with the bulk of the move showing over the past two trading days. This brings on the question as to whether we’ll finally see some element of pullback in that well-built downtrend that’s now more than a year old. Given that both the ECB and BoJ appear to have some room to pose a dovish push towards monetary policy, and also given that both the Euro and the Yen are holding on to varying degrees of strength; we may be looking at a near-term continuation of USD gains. The next Fed meeting takes place next week, on May 1-2, but this is a non-press conference meeting and there are few expectations for any moves there. The next big FOMC meeting of interest takes place on June 12-13, and this is when we’ll get updated projections and guidance and, possibly, another rate hike. On the below eight-hour chart, we’re focusing in on nearby resistance in USD. The March swing-high at 90.94 is the three-month high in DXY, and 91.01 is the 2017 low. 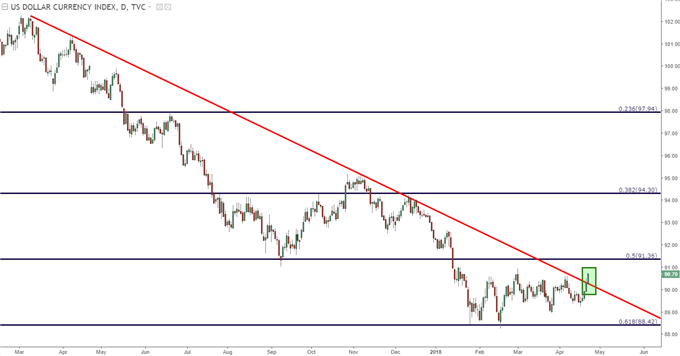 A bit-higher at 91.36 we have the 50% retracement of the 2014-2017 major move, and this is the same Fibonacci study from which the 61.8% retracement has helped to set support in 2018. 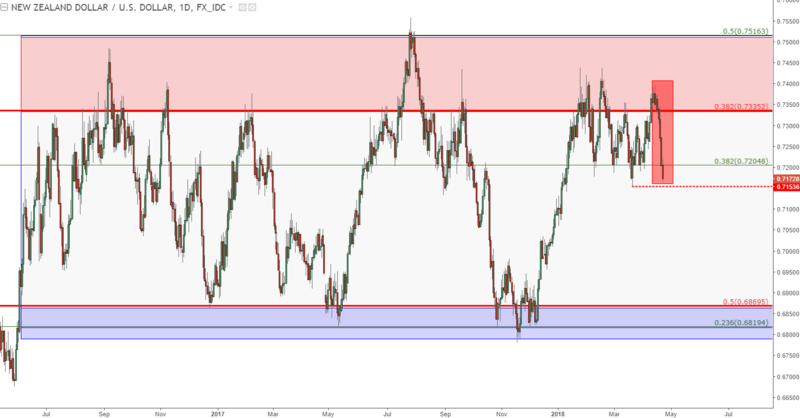 EUR/USD is testing the first area of support that we were looking for on Friday, and this comes-in at a confluent area taken from the mid-March and early-April swing-lows, which also happens to come-in around a trend-line projection taken from the March and April lows. 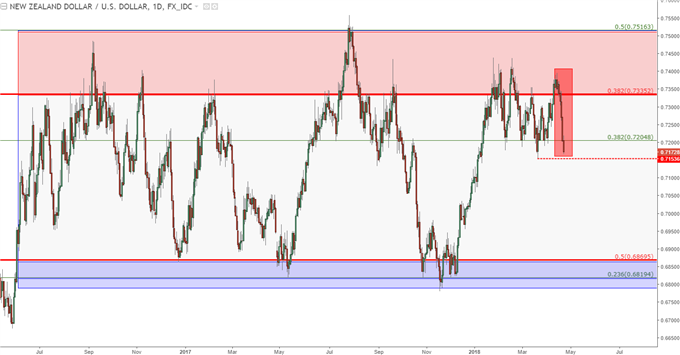 A bit deeper we have another level of interest at 1.2167, as this is the 50% retracement of the 2014-2017 major move, and this level has twice come-in as key support already in 2018 for EUR/USD. If a down-ward break doesn’t hold up there, the 1.2000 level is exposed for a re-test. 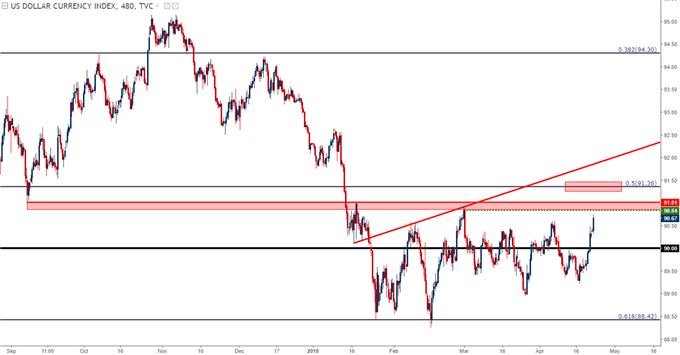 We came into this week looking for a topside breakout in USD/JPY, and so far that’s taken place as the pair is now trading at fresh two-month highs. Last week saw Japanese inflation settle after two really strong months created the possibility of the Bank of Japan finding themselves in an ECB-like scenario later this year. But with inflation falling back to 1.1%, a bit of pressure has been removed from that prior theme of Yen-strength, and the door may be soon re-opening to another run of Yen-weakness. 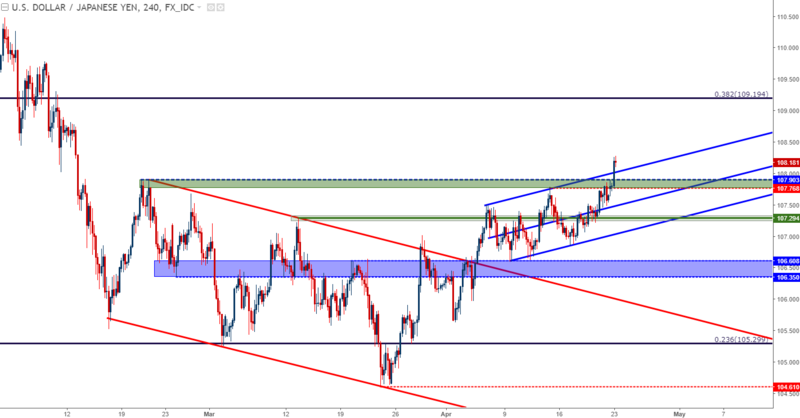 In USD/JPY, we have a bullish break above a bullish channel, and traders would likely want to wait for a pullback before looking to take on additional topside exposure. On the below four-hour chart, we look at two areas that remain interesting for higher-low support plays In USD/JPY. We looked at the short-side of NZD/USD last week just ahead of the US Dollar’s run of strength, and the pair is now making a fast approach towards three-month lows. The backdrop behind the pair offers a range-bound formation that’s been at work since the summer of 2016, and prices spent the better part of the past two months testing around the resistance side of that range. 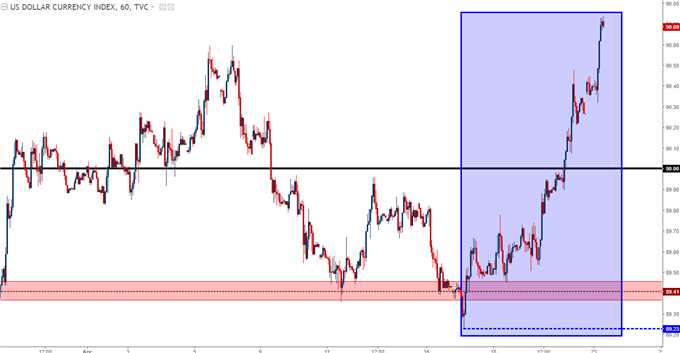 As USD-strength has started to creep-in, that range in NZD/USD has started to fill, and if this is to continue, the areas around .7000 and .6900 are exposed for short-side targets. 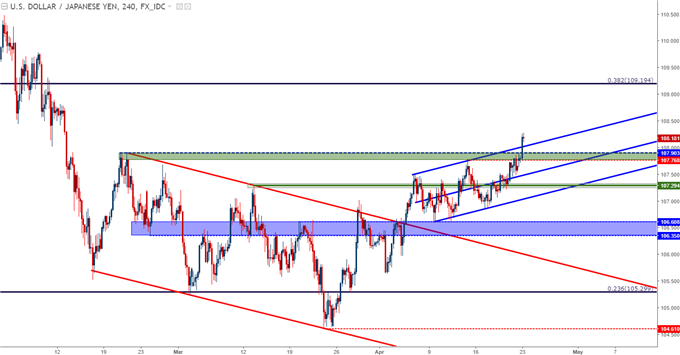 We were following the bullish breakout in GBP/USD, and that theme hit fever pitch last week ahead of the UK inflation release, as a fresh post-Brexit high printed just shy of 1.4400. But no more than week later and the pair is lower by more than 400 pips, as a one-two combo of disappointing inflation combined with dovish comments from Mark Carney were enough to dent that bullish trend. We looked at a bearish pin bar that had formed in GBP/USD last Tuesday ahead of the inflation release, and that bearish momentum has continued to drive, with prices now trading back-below the 1.4000 psychological level. On shorter-term charts, there is still no evidence of a near-term bottom, so for those looking to buy, they’d likely want to let this current strain of weakness run its course before looking to stage support plays.